We offer a great product launch venue with style and professionalism to help enhance your brand. With cutting-edge AV technology, we can set up our rooms to help you host an innovative and exciting launch event. We are located in an attractive location, next to Big Ben and Westminster Abbey, allowing your guests to enjoy an iconic backdrop in a venue full of character and history. With state-of-the-art technology and an award winning in-house AV team, we can create unique staging, lighting and sound for your event. You can choose one of our AV packages or ask our technicians to create something completely bespoke for your event. We offer a wide range of delicious and seasonal menus including canapés, hot and cold buffets and creative refreshment breaks to suit your event. The organisation was excellent and the staff were brilliant! One of the guests commented that it was one of the best book launches that he has ever been to - and this is much down to your organisation. Located in the heart of London our exclusive venue offers a great event space for product launch events. Our venue will give your event a unique touch and will provide an unforgettable experience to your visitors which will bring more customer awareness to your brand. Our nineteen conference & meeting rooms are full of character and range from the large and impressive to the small and intimate. 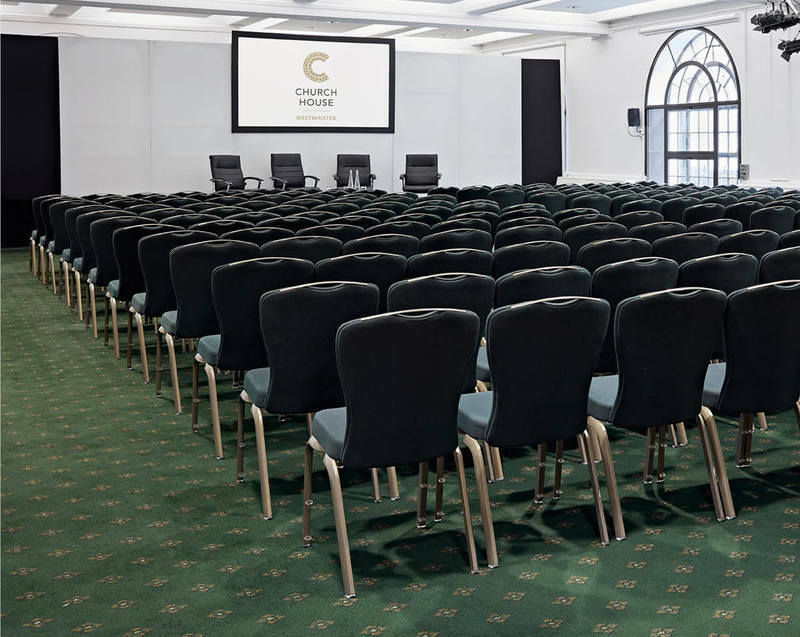 The Assembly Hall is The largest event room at Church House Westminster which has a theatre style capacity of over 600. The hall is round in shape and has an impressive domed roof and oak panelling. Designed by world renowned architect Sir Herbert Baker, the Assembly Hall is the impressive centre piece of this central London venue. The room is split over two levels a capacity of 468 on the lower level and 132 in the gallery, which runs around the whole room. On the gallery level there are 15 arched window giving natural daylight, alternatively the room can be darkened if required. Sound and video systems are vital for an event like product launch, this is why our in-house Audio Visual team will work closely with you to create the perfect staging, lighting and sound for your event. We have developed solutions to suit your needs and transform any space to fit your event`s theme and requirements. We cater for breakfasts, lunches, dinners and evening receptions. Our in-house caterer, Ampersand, will deliver a mouth watering menu for your guests and will cater for all dietaries and any other special requirement. If you have any questions about our product launch venues in Westminster, Central London, please call us on 020 7390 1590 or fill in our contact form.